I’ve been using this app for several years and am really impressed with how it works. I usually use a single rune pull to help me clarify my thinking on various decisions, and it hasn’t steered me wrong yet. The simplicity of use and interpretations are particularly good compared to everything else I’ve looked at on the web. 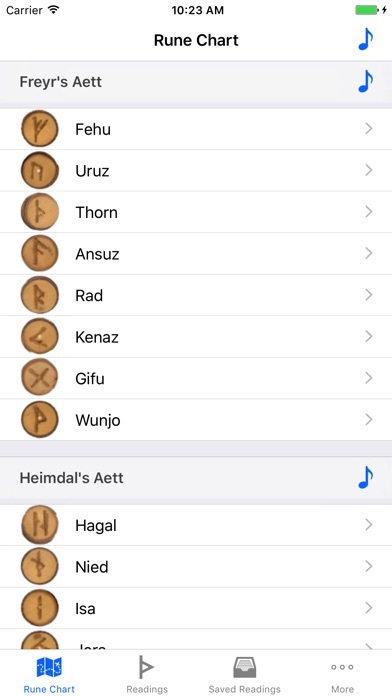 Take a top-notch Runes app and add an entire text into the mix and you've got the best Runes application bar none. This app is for true and level-headed students of the Runes. The interface is intuitive and pleasing and the content is excellent. I have several apps of runes and none compare to this one. It's accurate, has friendly interface, is beautiful to look at, you can opt for inverted runes, music or no music (depending of the environment you're at)... All in all it's just the best. Not quite . . . I must take issue with this app. I am not sure why the author decided to mix the Proto-Germanic names and the Anglo-Saxon names for the runes. She should have stuck with one or the other. If you use fehu (Proto-Germanic) instead of feoh (Anglo-Saxon) then use berkano (Proto-Germanic) rather than beorc (Anglo-Saxon). Immediately upon realizing this, the credibility of the author and the app took a serious downward turn for me. Having studied the runes quite a bit as well, the descriptions are waaaay too simplistic. (Although I admit this is a bit of a problem with the other three rune apps I have--you can only get so in-depth in these small apps.) Fehu, for example does mean cattle which equates to wealth but not just of money or energy. It means abundance in terms of hearth and home, family, etc. as well as success of the tribe or herd. It is also not as interesting or attractive visually as the other apps. The singing is beautiful and her pronunciation of old Norse seems authentic and is educational. The interpretations are rambling,unfocused and don't conform to traditional understanding. "Sun Goddess"? Give me a break.Go burn your bra elsewhere. Wish I could get my money back. The level of craftsmanship put in to this app is phenominal. Every time a rune is cast it is cast for you. This is not a program of ones and zeros, it is a right and proper reading. The app is easy to use and has wonderful explanations of all meanings. 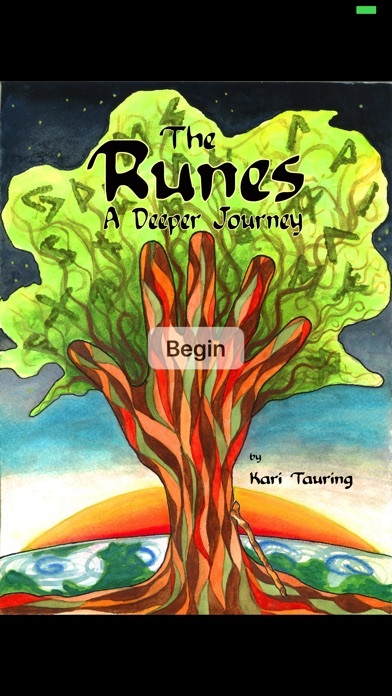 Plus, one of Kari's beautiful rune songs plays if you have sound enabled. This app is so worth it if you are at all interested in learning about the wonders of Nordic rune casting. Kari tauring is an amazing teacher, artist, and person in general. I have reluctantly upgraded to an iPhone but I am so glad I did and am finally able to see this app. It is fantastic. She speaks out each rune and sings them. Really calls to my core being. I am grateful for all she does including this app she has created. Kari is an inspiration and this app will certainly be of help in my studies and knowing of each rune. Thank you kari. Yay! What I have been looking for! This app is fantastic! Taurings history lessons, translations and music are amazing. I haven't even used all the features yet and it's already well worth it!! I'd like to think my fates are this kind, but every time I start the app and cast a single rune it comes back the same: Wunjo upright. The second reading is always Nied. Always. For the solitary or community practitioner....learn to play with the Runes. Beautiful woman entones for you and you can happily sing along interesting reminders and interpretations enjoy! Kari knows her stuff and now we get to hear her sing all the runes. She has a beautiful and powerful voice. I love this app which is really more like a book on rune and norse lore. Amazing app! For someone without a physical set of Runes, it's wonderful. Once my first set finds me, this app will still be a great companion. 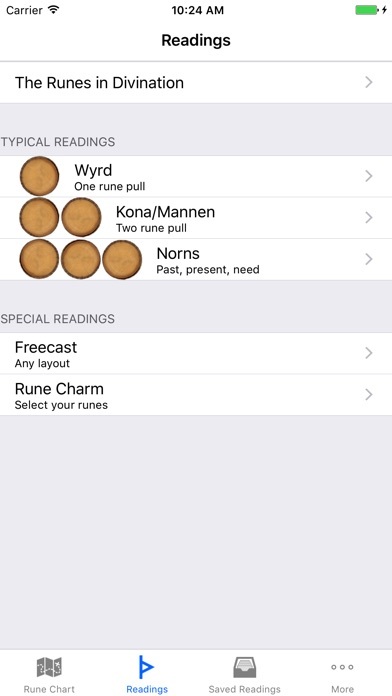 Request: please update so that the saved readings show the Runes in the order pulled instead of their order in the Rune list. Thanks!